TAMPA, Fla. – Donors, faculty, staff, students, and loved ones filled Traditions Hall at the Gibbons Alumni Center on April 15, 2016 to celebrate the awards presented to graduate and undergraduate students from the USF Department of English. During the past decade, Hawkins hired 25 permanent faculty, directed or co-directed eight dissertations, and completed lifetime total 1,000 Modern Language Association (MLA) interviews. He served on numerous USF committees, including the Academic Affairs Budget Planning Workgroup, Provost’s Budget Taskforce, Humanities Institute Advisory Committee, Sustainable Healthy Communities Search Committee, CAS Council of Chairs, CAS Chairs Steering Committee, CAS Promotion and Tenure Committee, USF World Taskforce, CAS Governance Document Committee, Phi Beta Kappa Steering Committee, Quality Enhancement Plan Advisory Committee, SHUM Chairs Committee, ACE workgroup for the Board of Trustees, and General Education Council. Hawkins also served as President for the South Atlantic MLA and delivered their keynote address in 2010 on “Human Rights and the Humanities,” which was subsequently published. Hawkins, as Runge’s address conveyed, worked tirelessly to “protect the interests of the English department” during his tenure as department chair from 2006 to 2016. 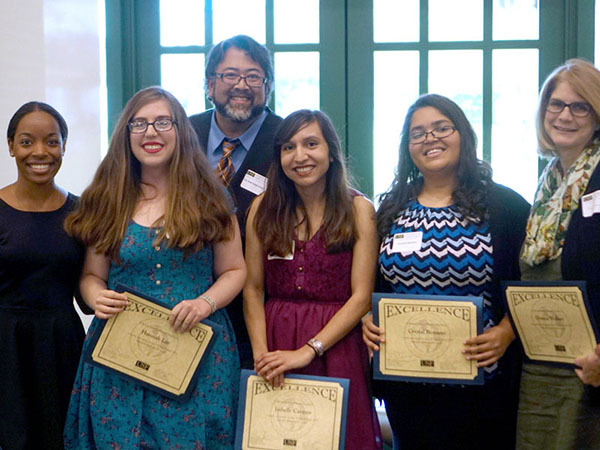 This annual ceremony affirms the dedication and commitment of the English students and showcases their contributions to the academic community at USF and beyond. Congratulations to all of the honorees and winners! Sara Munson Deats and Conrad Gordon Deats. “Cats I Have Loved.” Strategic Book Publishing, 2015. Jarod Roselló. “The Well-Dressed Bear Will (Never) Be Found.” Publishing Genius Press, 2015. Heather Fox is a doctoral candidate in English (literature). She is the research assistant for the associate chair of the English department and the news editor for the department. She can be reached at heatherfox@mail.usf.edu.